Kanipakam is a village, on the bank of Bahuda river located in Irala mandal of Chittoor district, Andhra Pradesh. It is about 11 kms from Chittoor town and 70 kms from Tirupati. Kanipakam houses Sri Vara sidhi Vinayaka Temple which is significant for its purity and rich heritage. There is a general belief that Lord Ganesha is the upholder of truth and in Kanipakam, many people experience this belief when they confront the idol of Lord Ganesha. The name Kanipakam means flow of water into wetlands. “Kani” means ‘wetland’ and “Pakam” means ‘flow of water’. The beauty of the place and the prominence for its sanctity, makes it a must-visit place. It was constructed in the early 11th century CE by the Chola king Kulothunga Chola I and was expanded further in 1336 by the Emperors of Vijayanagara dynasty. Local legends claim that the idol of Ganesha continuously grows in size. The temple was too small to be patronized by Chola and Vijayanagara kings. The temples of Cholas and Vijayanagaras are normally magnificent in size and grandeur. Most of the present structures are of recent origin and the present major developmental and construction activities of the temple are well supported by offerings given to the temple by the devotees. According to the temple legend there were three brothers, each with a handicap: one was mute, one was deaf and one was blind. They earned their livelihood by cultivating a small piece of land. They used channels to irrigate their fields, and as one of them guided the water, the other two drew water. On one such occasion they found that the water in the well dried up and they could no longer continue their work. One of them got into the well and excavated it. He was taken aback when his shovel struck a stonelike formation. He was shocked to see blood oozing out from it. Within a few seconds the clear well water turned blood red. This divine sight cured the three brothers on the spot. As soon as the villagers discovered this miracle, they thronged to the well and tried to deepen the well further but were thwarted when the swayambhu idol (the self-manifested) of Lord Vinayaka emerged from the swirling waters. Ultimately they offered many coconuts with prayers before the new idol. The coconuts' water covered than one and a quarter acres. This incident led to the modification of the usage of the Tamil word Kaniparakam into Kanipakam. Even today the idol is in the original well and the springs of the well are perennial. During the rainy season, the holy water overflows from the well even today. Another striking and strange feature of the idol is that it is growing in size. At present, we can see the knees and the abdomen of the idol. The old and present Kavachams are on public display in the temple and the temple is planning an expansion. The holy water from the well is offered to the devotees as theertham. For accommodation, there are rooms available by Kanipakam devasthanam and nearly 14 rooms by TTD Choultries. There are some 100 rooms under construction for accommodation. Also, you can stay at Tirupati which is nearly 70 kms from Kanipakam. Kanipakam can be reached by air, rail or road. 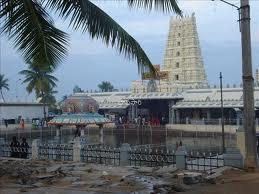 The temple is just 70 kms from Tirupati and can be easily reached by your own vehicle or taxis. The direct buses available from Tirupati. The nearest railway station is Chittor, which is 11 kms away. The nearest airport is Renigunta. From here you can hire a taxi and reach Kanipakam.